Why I like it: I have only had this pattern a couple of months, but the second I made my first dress with it I knew that I would be stealing its style elements for other garments. I LOVE the hidden pocket, and wish I had had it for my other pocketed frocks, like my Traditional Mexican and my Elegant dresses. I put it to good use right away in my Spring Dress, using both the pocket design and the accompanying pleating. The pleating is so handy that I could definitely see myself using the bust darts in another design as well. For my Striped Dress, I borrowed the puffed sleeve design to add a little extra detail to an otherwise simple pattern combo. 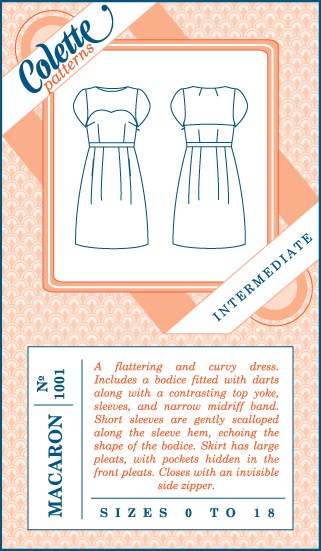 While the Macaron dress pattern in full might be a little much to replicate again and again (although it appears as though some have done it), the design elements are a nice guide for making many more figure-fitting, curve-hugging outfits.